General Dynamics believes in the quality of their products, which is why the company investment in the completely redesigned Bluefin-9 has yielded significant improvements to the design, production quality, modularity and reliability. 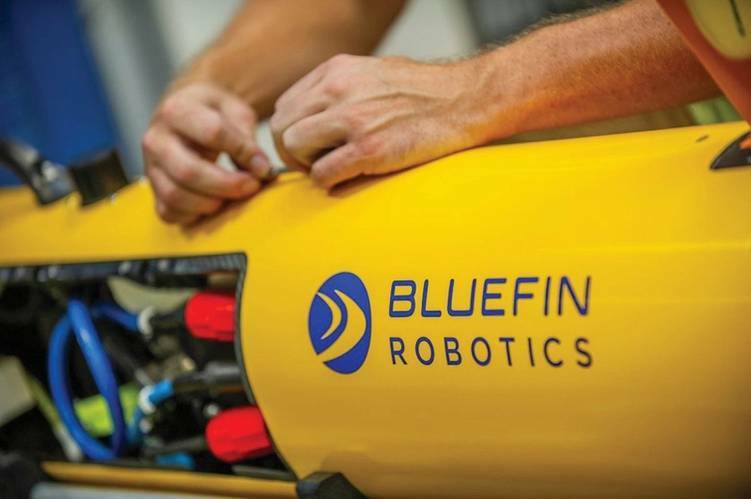 The entire Bluefin Robotics product family upgrades results in UUVs with more mission capability and lower total cost of ownership. Using our expert engineering and manufacturing tradecraft, the Bluefin-9 has been purpose-built to provide capability that only larger UUVs could previously offer. Combining high navigational accuracy, outstanding sonar resolution, and a host of new on-board processing capabilities, the Bluefin-9 delivers operators highly detailed subsurface information in minutes rather than hours. The Bluefin-9 is the tool for defense, industrial, and academic applications that value data quality, reliability, and ease-of-use. General Dynamics Mission Systems specializes in systems integration. With data quality being of the utmost importance to UUV operators, it’s necessary to evaluate the three main components that directly impact the ability to collect and process data. First are the sensors themselves. The Bluefin-9’s sensors provide optimal data quality for the application. Then, to accurately place data in four dimensions, a highly accurate navigation and timing solution is engineered. Finally, understanding that the observing platform must not move erratically or inconsistently, the Bluefin-9 employs dynamic control tuning that nullifies as much of that variation as possible. When these criteria are carefully followed, the Bluefin-9 delivers operators timely, relevant, and accurate data across a variety of mission domains. The Bluefin-9 is a two-man portable littoral survey vehicle weighing in at 155 pounds (70 kg) and measuring 95 inches (241 cm) long and operates at depths up to 200 meters. General Dynamics has built upon previous free-flooded designs by outfitting the Bluefin-9 with a full carbon fiber body, providing additional strength improvements and weight savings. The redesigned gimbaled thruster is able to drive the vehicle at maintained survey speeds of three knots and comfortably propel the vehicle at sustained speeds of six knots. The new 1.9 kWh field-replaceable rechargeable battery delivers up to eight hours of operation (two hours transit, six hours survey at three knots) and provides 33 percent more energy density for the same weight as its predecessor 1.5kWh battery. The oblong, small-class Bluefin-9 is 9.375″ (23.8 cm) W x 10.375″ (26.4 cm) H and offers increased stability in water over previous designs thanks to improved weight separation and innovative packaging. The coupling between the integrated Inertial Navigation System and the Doppler Velocity Log delivers navigation accuracy that easily meets 0.3% D.T. CEP 50 requirements. 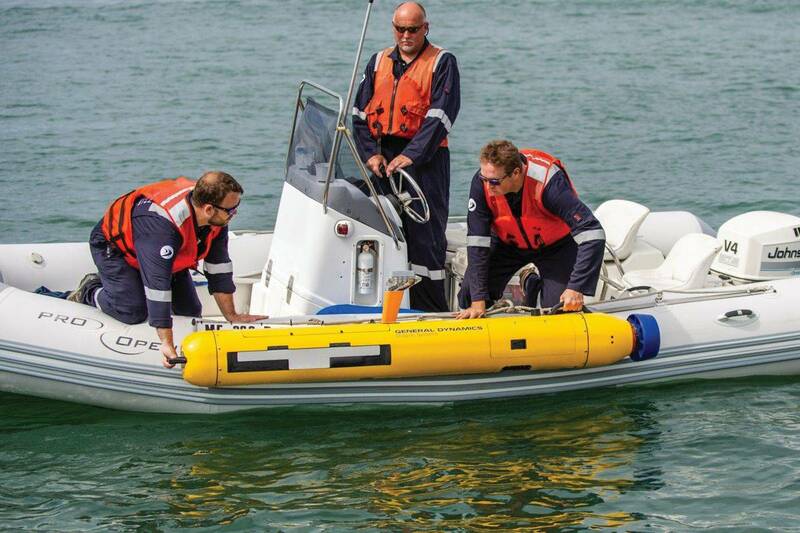 The Bluefin-9 UUV can be rapidly deployed and recovered by two men at dockside, over the side of a rigid hull inflatable boat (RHIB), or from other vessels of opportunity. 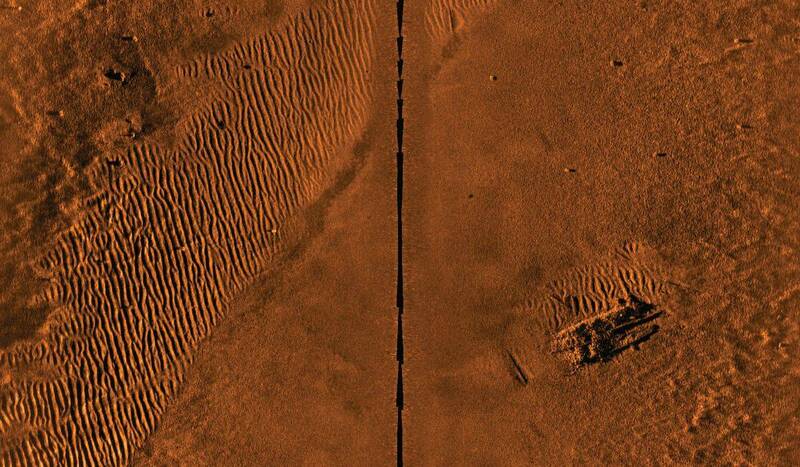 After a mission, UUVs are full of data and out of energy. 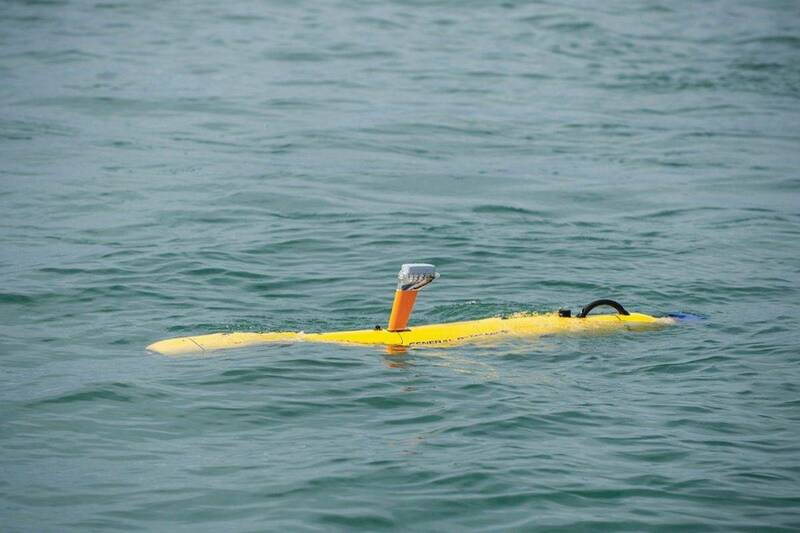 Before a UUV can be redeployed, its batteries must be changed or recharged and data offloaded. The new Removable Data Storage Module (RDSM) coupled with the removable battery means that the Bluefin-9 can be recovered and redeployed in 30 minutes or less to start another 8 hour mission. Using this approach, the Bluefin-9 achieves sustained area coverage rates that previously required operators to endure timely recharging cycles or use costly multiple-vehicle solutions. o Sonardyne Solstice Multi-Aperture Sonar (MAS): This high-resolution, interferometric side scan sonar was built for UUV integration and provides class-leading data in a low-power (18 Watts) solution. The Sonardyne Solstice outpaces current side scan sonars available for small-class UUV integration and delivers near-Synthetic Aperture Sonar (SAS) quality imagery and bathymetry across a 200 meter swath range. An impressive along-track resolution of 0.15 degrees Solstice integrated on the Bluefin-9 maximizes effective resolution, decreases false-positives, and improves operational efficiencies. The image below shows recent data collected in Boston Harbor with the Bluefin-9. Degradation in image quality towards the edge of the swath is minimal and there is an incredibly high signal-to-noise ratio. These small artifacts are conventional lobster pots. Note the distinction between their shape and the surrounding environment. The ability to clearly discern one of the lobster pots at an across-track range of 92 meters is a compelling example of the effective scanning range of this system. This contrast leads to better estimates of highlight and shadow pairs, which lead to better operator decisions and improved performance of any third-party image recognition that an operator may use. o Removable Data Storage Module (RDSM) with Camera: The new RDSM acts as an independent data processor, generating and storing post-processed data with a simple interface to an operator’s workstation. The RDSM contains a high-definition, machine vision-grade monochrome camera that captures still images and video. The use of a monochrome camera, instead of a color one, leads to lower noise and higher overall image quality in a low-light, subsea environment. Imagery is geotagged for easy review during post mission analysis. Researchers can use the RDSM processor to run front-seat autonomy solutions via the Bluefin Robotics Standard Payload Interface (SPI). o Improved Navigation and Timing: The Bluefin-9 incorporates a 1MHz Doppler Velocity Log (DVL), Inertial Navigation System (INS), and high-precision GPS that feed the system’s dynamic control architecture. New on-board clock management and synchronization features further add to the confidence of this data and support the superior data quality provided by the platform as a whole. o Emergency Operations System: An innovative emergency operations system that provides redundancy to the Bluefin-9’s core functions in the event of a failure. An independently powered, low-power microcontroller ensures key communications systems are able to provide vehicle position and telemetry to an operator to facilitate prompt and safe recovery of the vehicle. • Rugged Operator Laptop: Pre-loaded laptop with all necessary software to interface with the Bluefin-9 UUV, including Bluefin Planner and Bluefin Dashboard applications. • Topside Radio Direction Finder (RDF): Radio directional finder tracker and antenna allows for measuring the direction of the vehicle when surfaced. This is an independently powered system separate from the main electronics and is generally used in non-standard recovery operations. • 1.9kWh Battery Charger: The battery charger unit is a self-contained charging unit that can charge two UUV batteries simultaneously. Two batteries can be recharged from fully depleted in six hours. • Toolkit: A multi-purpose tool kit containing common hand tools that are needed for line-replaceable units (LRUs) and perform regular service of the vehicle. • Shipping Case: A hardened shipping case with inserts to safely pack and stow the Bluefin-9 vehicle. — Topside Communications Hub (TCH): The advanced Topside Communications Hub is a self-contained and self-powered interface that centralizes all topside services to the Bluefin Robotics UUV and enables multi-vehicle operations. The TCH provides reliable communications with the deployed UUV and displays vehicle position and telemetry information to the operator via a web interface. The TCH also provides a future avenue for dynamic re-tasking by an operator while the UUV is underway. — Topside Junction Box (TJB): The Topside Junction Box provides gigabit Ethernet communications and power. The box includes connections for an acoustic transducer, RDSM, the operator laptop, and the Topside Communications Hub. It is designed to be used on small vessels with internal battery power or shipboard power. — Shore Power Box (SPB): The Shore Power Box is a single unit that provides external power to the vehicle and Ethernet communications in a weather resistant case. Shore power is used to power the vehicle on deck without draining the batteries installed in the vehicles. The communications connection provides a gigabit Ethernet line between the vehicle and the operator laptop. This direct Ethernet connection is used during troubleshooting and maintenance. General Dynamics also provides live and virtual training packages for operators and maintainers as an additional available service. A team of expert marine operators provides expertise to courses hosted at the Bluefin Robotics facility in Quincy, MA, and on-site at customer locations around the world. 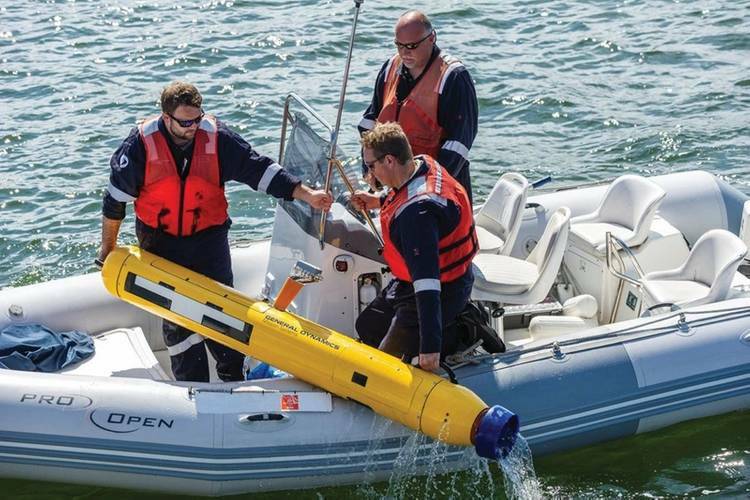 The Bluefin-9 provides the knowledge and situational awareness that can inform next steps for the U.S. Navy, environmental surveying teams, industrial clients, and researchers at academic institutions worldwide. The completely redesigned Bluefin-9 is already in demand, with the initial build of vehicles contracted by an international operator and a series of deliveries scheduled throughout early 2019. New orders taken between now and the end of the year will be delivered beginning in the second quarter of 2019.